We always enjoy working with brides who know exactly what they want. 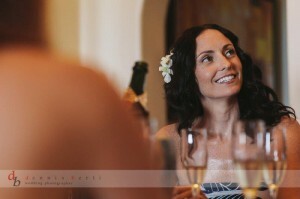 Alisha envisioned herself with super natural curls and barely there make-up, so of course we were happy to oblige! Alisha’s hair and make-up trial was essential to giving this bride the look of her dreams, since she decided to go even more natural after her test run. Whether you want a natural glow or a more dramatic look for your wedding day, we always recommend a hair and make-up trial to get a better idea of your expectations and give yourself peace of mind for your most important day. 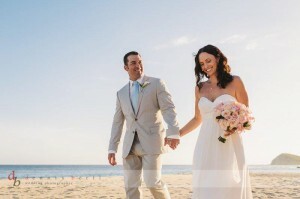 To pull off this soft beachy look, we styled Alisha’s long, dark hair in the loosest of curls that went perfectly with her strapless wedding gown. Her make-up was minimal, with a touch of foundation, neutral shadow and defining mascara as the finishing touch. We also had the honor of doing hair and make-up for Alisha’s mother, as well as the wedding hairstyles for the groom’s mother and the couple’s lovely bridesmaids. 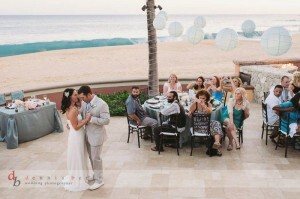 This entry was posted in Blog and tagged Cabo Destination Wedding, Cabo wedding design, Linens, Los Cabos wedding, Sheraton Los Cabos, Things and More..., Vivid Occasions wedding planner, Wedding hair and make-up Cabo. 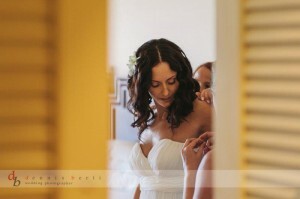 Sandy’s wedding hair and make-up at the Esperanza resort!